The senior living smart home revolution is in full swing, and Kisco Senior Living is buying in with Amazon’s Alexa. Starting with a kickoff event last month, Kisco has been installing Amazon Echo Dot voice systems with Alexa in all 165 independent living (IL) units in its continuing care retirement community (CCRC) The Cardinal at North Hills in Raleigh, North Carolina. The majority are already installed, senior vice president of operations Brian Grandbouche told Senior Housing News via email. To run the system, the Carlsbad, California-based senior living provider partnered with senior-centric technology company K4Connect, also of Raleigh. Residents are using the smart home system to operate their lights and thermostats and to receive information about community events. K4 is also working on a function for The Cardinal residents that will allow them to use Alexa to register for those events. The company views the platform as benefiting all of the community’s IL residents, particularly those with sight impairment. “I love it — I think most of the people are loving it already,” said Libby Powell, a 75-year-old IL resident at The Cardinal. Kisco and K4 started working together in 2015, and last March K4 gave The Cardinal residents tablets, Powell said. She likened it to a community bulletin board, where residents could access information on events, meal menus, the weather and other basic information items. Some residents, though, struggled to physically use the tablets. “When they first brought it out, within a month, I was asking, ‘When are you going to do something with voice?’” she said. She was among the residents who had experience with Alexa, and noted that many in the community were excited to receive the Echo Dots. For now, Kisco is keeping the Alexa system strictly within the IL population at The Cardinal, which also includes 27 assisted living units, 18 memory care and 14 skilled nursing. Kisco is one of many operators bringing smart home technology, including voice-activated tech, into communities, with a focus on improving operational efficiency, staff efficiency, resident happiness and resident safety. In January of 2017, Masonic Villages of Elizabethtown, Pennsylvania, rolled out a smart home, dubbed an “IQ Home,” which will be its template across its entire portfolio, consisting of five communities in Pennsylvania. Masonic will add 24 IQ townhomes and 10 IQ cottages in June, followed by 24 more IQ townhomes in January 2020. In Rockville, Maryland, the Ingleside family of life plan communities is bringing voice-enabled smart technology to their residents, also with Amazon’s Alexa, with the adoption rate at one Ingleside community up to 96%. And in Atlanta, Thrive Senior Living announced at the start of January plans to “integrate conversational artificial intelligence” across its entire portfolio — 24 communities — in 2019. It will do so through a partnership with Los Angeles-based startup Aiva, whose platform is the first to solve the issue of HIPAA compliance with Amazon Alexa and Google Assistant in a scalable fashion. Other operators are getting into the action too, with various stages of implementation. Among those discussed in SHN’s smart homes report are Vincentian Collaborative System of Pittsburgh, Front Porch of Glendale, California and The Lofts at Timber Ridge of Issaquah, Washington. For Powell, that experience includes socialization. Though she lives with her husband, he has health problems, and when he is sleeping, she finds conversations with Alexa calming, and a powerful deterrent to loneliness. 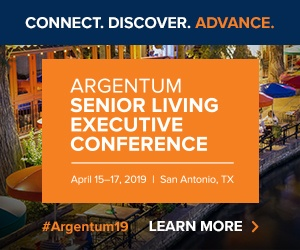 Interested in learning more about the smart home revolution in senior living? Click here to access Senior Housing News’ deep-dive report on the topic.